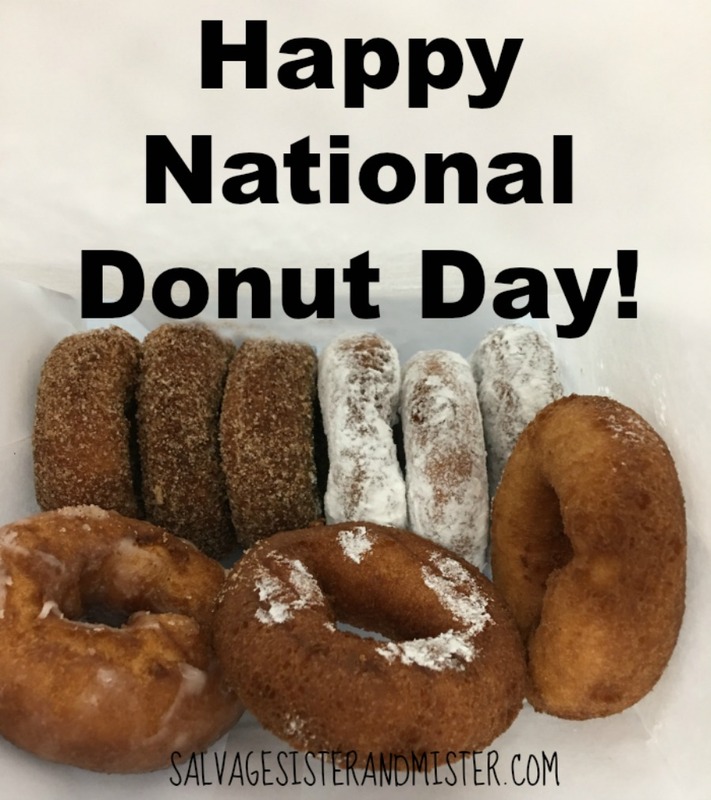 Did you know June 1st is National Donut Day? I heard about it last minute, so I grabbed some store donuts -which I NEVER do – for the family. Usually, if we are eating donuts it’s a little ah-mazing donut shop in our town…… however they were already closed, and I wanted to surprise the guys. Well, the men must like the little local shop better as not many were eaten. I am too embarrassed to say how long they sat there for, but I did keep checking to see if they were still okay…….. which they were. I knew I would try some bread pudding with them cause I don’t want to throw away unless I have to. If this is not what you do with food, PLEASE STICK WITH ME!!!! My saying in life is, there is no time for bad food. 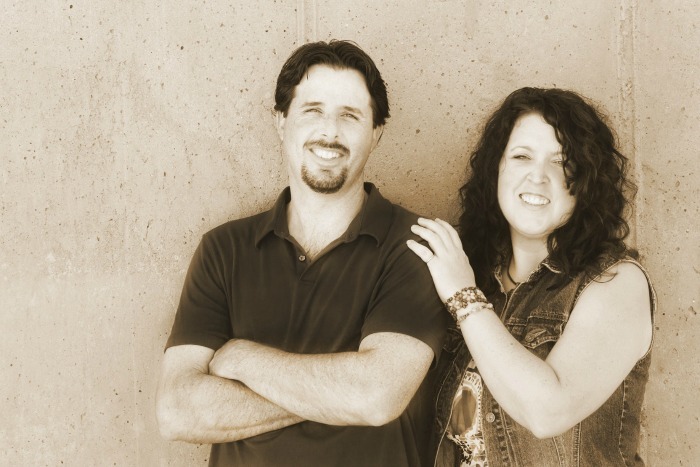 I wouldn’t make something I didn’t think had a shot. 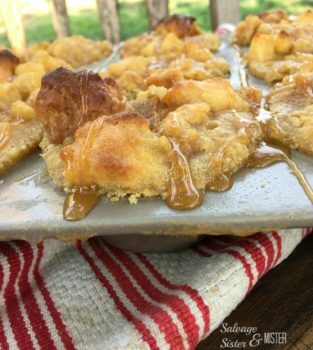 Stale bread is what is used for bread pudding so donuts are just sweet fried bread. And not only did the doughnut bread pudding muffins have a shot……they were devoured. 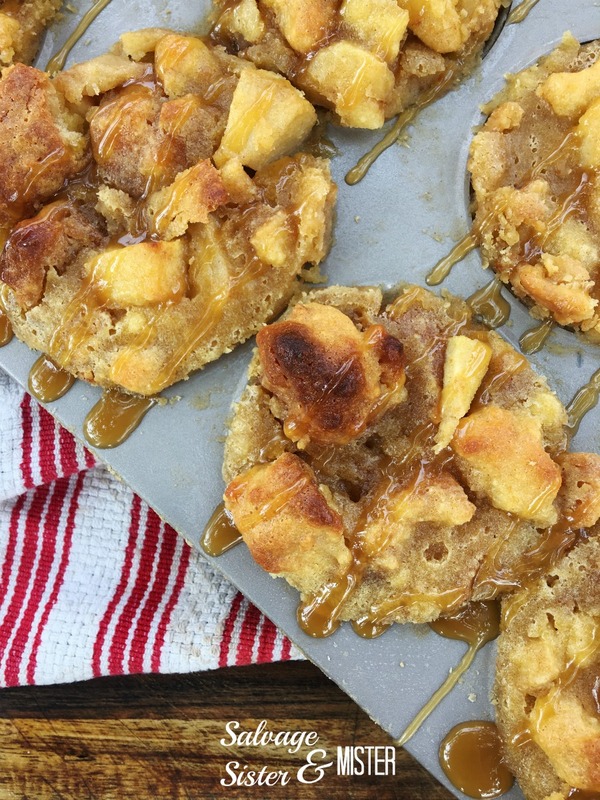 I mean really, if you add sugar, cream, butter, apples, caramel, and cinnamon…….how could you go wrong? Give stale doughnuts a new life by turning them into bread budding dessert. 1/2 C sugar *Use your judgement on more of less based on how sugary your donuts are (glazed and such). 20-25 STALE Doughnuts Similiar style/flavor doughnuts work best and cake doughnuts work really well. Preheat over to 350 degrees. Butter your muffin tin. *Reuse Tip - Save your butter wrappers in a zip bag in the fridge. Each time you need to butter a pan, pull one out and use the remaining butter on the wrapper to coat your pan. Core and peel your apples. Melt butter in a medium skillet over medium to high heat. 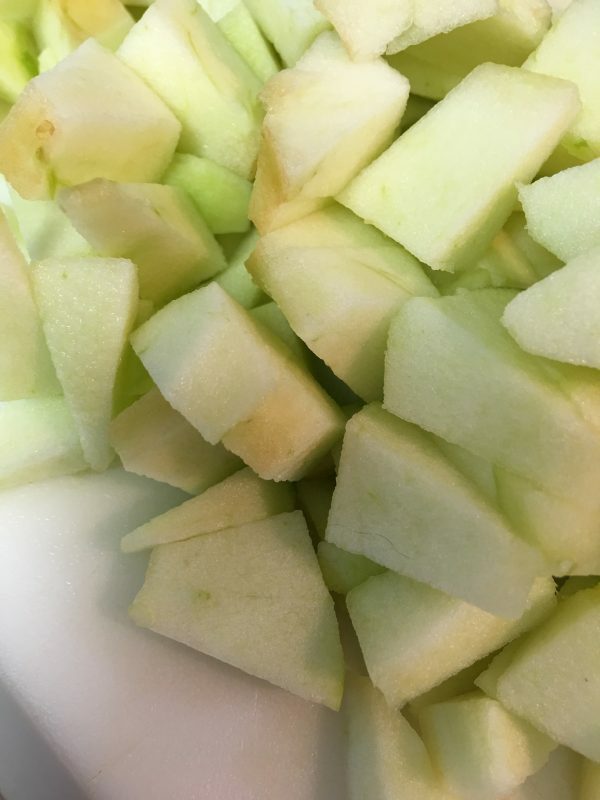 Add peeled and cubed apples and half the salt and cinnamon. Cook until tender, stirring often. Take off heat and let cool. 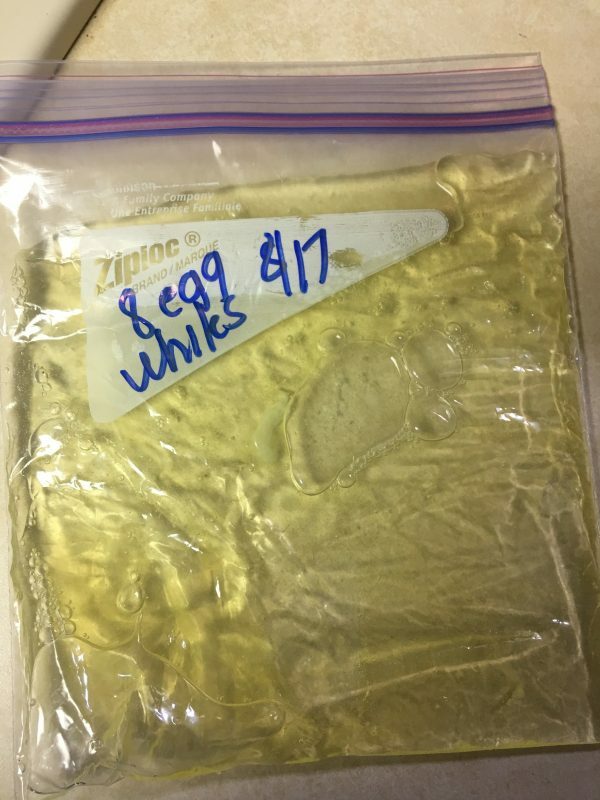 Separate 6 eggs (freeze whites for another occasion). In a large bowl, combine cream, milk, sugar, egg yolks, eggs, and remaining salt and cinnamon. 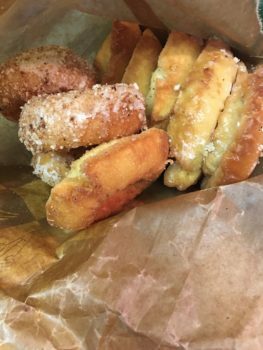 Chop up doughnuts into small bite size pieces. 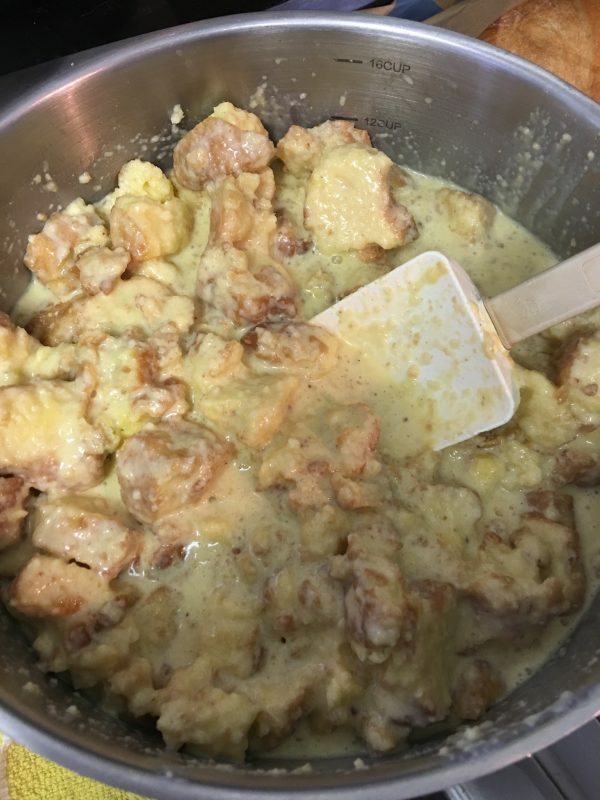 Add cooled apples and doughnuts to the milk and egg mixture, Stir to combine and let stand for 10-15 minutes until the liquid is absorbed. 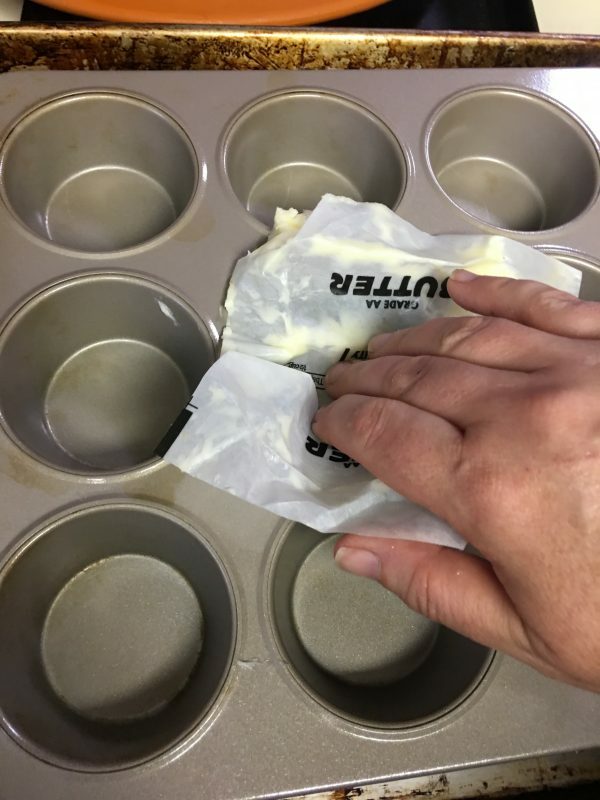 Add batter to muffin pan evenly and bake for approximately 25 minutes. Run a knife around the edge to remove a muffin and drizzle with caramel sauce. Great served warm with ice cream. Most of the doughnuts were hard, but I had a friend drop off a few doughnuts for me to add to this and they weren't as old. The staler the doughnuts the more structure (less mushy) for a bread pudding. As stated, I used cake donuts. I used a combination of glazed, crumb, and old fashioned. Have leftover donuts at work? 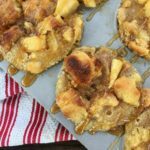 Save them in a freezer bag until you have enough to make some donut bread pudding muffins. In the pan apples were cooked in, test your batter by dropping a small amount and cook to taste. If batter needs more sugar you can add it or any additional seasoning needed. This could also be done in a 9X13 pan. If you need to dry out your donuts, place them in a low oven until they are hard. Yummmmy! These look so delicious and I can’t wait to try your recipe. Oh my! These look dangerously delicious! Will be saving this for an indulgent Sunday morning! Such a clever idea. I am finding lately that quite a bit of food is going to waste in my house and it kills me – a pet hate of mine is throwing food away. Definitely will try this. Does anyone have any suggestions on what to do with veggies that are just about to turn? Kim, There is a FB group NoFoodleftbehind1 that is a great place to ask questions on reducing food waste.